The Clifton Inn in Charlottesville, Virginia represents classic elegance as well as any venue. It is known for wonderful meals (I have had my fair share) and outstanding service. It’s not surprising that Ileana and Brooks chose the Clifton for their nuptials. The image I have chosen was taken before the wedding during Ileana’s final preparations. 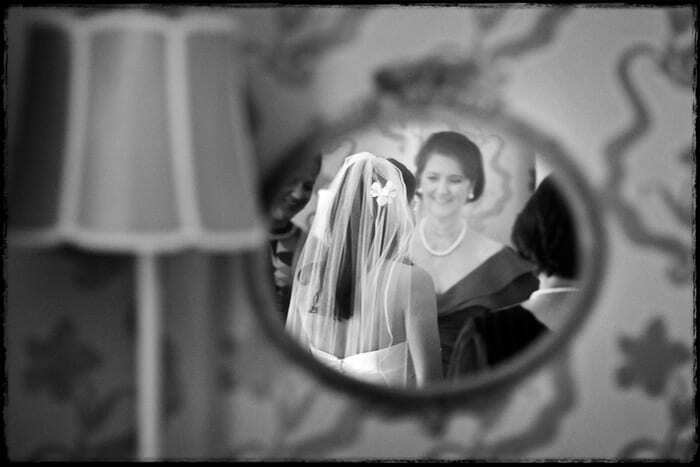 It’s always fun to add reflections to an image and a framing element quite frequently accompanies the look. As I walked into the room, I noticed this antique mirror against the background. The geometric pattern, composed nicely with the table lamp, and the mirror. From there I waited for something to happen. Brooks’ mother walked into the room, looked at her soon to be daughter-in-law, and smiled. I quietly made the exposure, knowing immediately that I had the shot I was after. After a little bit of dodging and burning and a conversion to black and white, the image was set. Rob Garland is the owner of Rob Garland Photographers, a company which specializes in photojournalism and fine art printing. Rob prides himself on a classic, intuitive, heartfelt documentation with the utmost in visual integrity. Rob has documented many destination weddings throughout the U.S. and abroad as well as Charlottesville weddings at many of our outstanding local venues. Rob loves imagery that fails to go in and out of style and personal touches that make each wedding unique.